The Sixers are up against the Nets in the postseason for the first time in decades. Philadelphia 76ers center Joel Embiid (21) controls the ball against Brooklyn Nets forward Joe Harris (12) during the first quarter at Wells Fargo Center. Of all the teams the Sixers could have faced from the bottom half of the Eastern Conference playoff bracket, the Brooklyn Nets seem like one of the tougher draws. All season long, neutral parties have forecasted that they'll be a "tough out" for anyone who has the misfortune of drawing them in round one of the NBA Playoffs. There is some truth to that. Brooklyn is a team built around the sort of players Philadelphia has struggled to stop all season long, and everyone remembers the beatdown they handed the Sixers way back in November. The roster has changed substantially since that meeting, but blowout losses tend to stick in your mind longer than an ordinary win, and the Nets were able to snag one before anyone was worried about saving their legs for the playoffs. But as I'll try to lay out here, there is a pretty decent gap between these teams, and the Sixers should be able to turn that into a comfortable series win as long as they come out ready to play. Rather than abandoning their gameplan to suit the moment, the Sixers will likely just need to be the best version of the team they've been all along. A quick disclaimer before we flash the chart, an explanation of effective field goal percentage: EFG simply adjusts field-goal percentage to account for three-point makes being worth more than two-point makes. Pretty simple. On the surface, there are a decent amount of similarities between the Sixers and their divisional foe to the north. Both teams rank among the league's best at defending the three-point line, and it is their belief in the importance of that area that drives their scheme. They both ended up with an extraordinarily average defense anyway — the Sixers edged Brooklyn out by fractions of percentage points in several defensive categories. Unlike in the opening series from last season, the Sixers are not going to have to fight to control the pace with Brooklyn. The Sixers remain an up-tempo team despite the addition of considerable half-court weaponry, and the young Nets will probably be happy to test the legs of the older Sixers by running at every opportunity, miss or make. The difference between the two teams, to state the obvious, is on the offensive end. Philadelphia, despite insistence from some fans that they should stop shooting so many threes and get off their damn lawn, is actually below average in three-point volume. With a post-up center and a point guard who won't shoot outside shots, this probably seems obvious, but it makes for an interesting dynamic. Brooklyn has an obvious strength on defense, and the Sixers may get around it without doing much to change their gameplan. To the chagrin of some Sixers fans, Philadelphia will be up against one of the higher volume pick-and-roll teams in the league. It is no secret that the Nets like to spread you out and allow their young ballhandlers attack you with space to operate. D'Angelo Russell is the head of the snake, but Caris LeVert and Spencer Dinwiddie are threats that should be taken seriously as well. Leave Joe Harris alone on the perimeter at your own peril — he has developed into one of the league's best shooters and hit over 47 percent of his attempts from deep this season. Look around, though, and the Nets are not as scary as some may believe. Their guard depth should not be taken lightly, but that's about the only area where they have quality depth. That matters against a team like the Sixers, who can simply lean on their big guns to play more minutes and impose their will. Four of Philadelphia's five starters can punish mismatches from the mid-post, which negates any advantage the Nets might gain from trying to force a small-ball game. Defending Russell will be priority No. 1 on the scouting report for Philadelphia. His poor outing the last time the teams met was the primary reason the Sixers picked up a comfortable win, and that will remain the case in the postseason. While guards who can shoot off of their own dribble have hurt the Sixers all year, Russell is not the total package yet. Foul-drawing remains a weakness in his game — he draws shooting fouls on just 4.2 percent of his shots, per Cleaning The Glass, a figure that puts him in the eighth percentile at his position. Shooting is important for guards in part because it should draw attention to you that you can weaponize as a driver. Russell hasn't quite figured that out yet, and he relies heavily on knocking down tough shots from midrange and beyond the arc. A word of caution, however: the Nets scored more points on drives this season than any other team in the league, averaging over 37 points per meeting. So while Russell himself has his struggles attacking the rim, Brooklyn did plenty of damage across four meetings going at the cup. The question for me is whether the Sixers will still be content to concede midrange looks to Russell and live with the results. Based on the evidence we have from this season, the answer is probably yes. That aforementioned game late in the year featured a Russell stinker, but the defensive principles were mostly the same for Philly as they've been all season. The Sixers fought through screens when appropriate, switched when they had the right players to execute it, and ultimately their goal was to keep Embiid close enough to the rim that they couldn't get burned by the roll man. The key here is fairly simple: if the Sixers can bait Russell into long midrange shots, they've already won. He actually shot worse from 14 feet to the three-point line (33 percent) than he did on threes from most areas this season, and he took 22 percent of his total attempts from that area. Russell's floater game will create havoc from 14 and in, but if Russell is trying to make a living there and not putting anyone in foul trouble, the Sixers will gladly live with the results. Making Russell work on defense is another way to slow him down, and that's where Philadelphia's midseason acquisitions will make a big difference. There are no easy outs in the starting lineup, and the Sixers can force him to defend the post, chase JJ Redick around screens, or explore any number of options to wear him out. 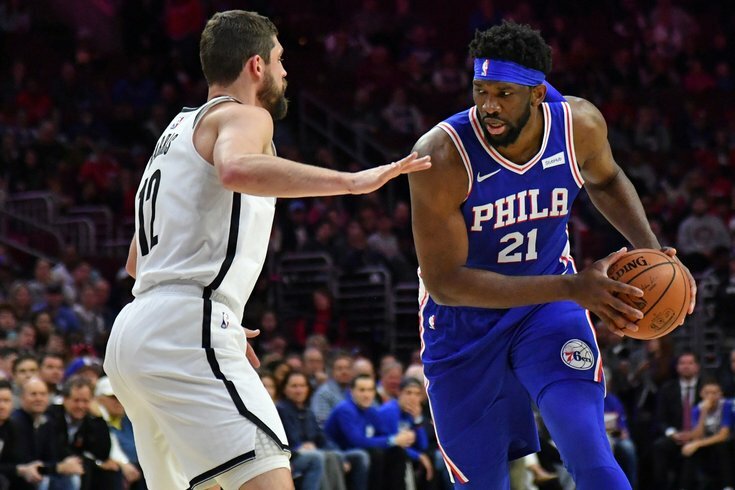 There are matchups in the Eastern Conference that might necessitate Embiid taking a backseat on offense to let someone else shine. This is not one of them. Embiid's numbers have been cartoonish in general this season, but the Nets have had absolutely no answer for him this year. His averages across four appearances — 30 points, 14.3 rebounds, and five assists per game on 60/45.5/80.4 shooting splits. The only opponent who Embiid was able to shoot more free-throw attempts against this season was Detroit, and I don't need to tell anyone reading this story how badly he owns Andre Drummond. The Sixers did a better job stopping Embiid against Brooklyn than the Nets did. Embiid's only underwhelming game against the Nets came in early November, the infamous blowout where he had just eight shot attempts in 32 minutes. I doubt the Sixers are going to forget to get him the ball in a playoff series. Philly doesn't have to overthink things here. Embiid can bury both of Brooklyn's primary big men in the post, and if they go even smaller than that, forget about it. First, let's get it out of the way that zone defense is for cowards. I know I will get some knuckleheads who will say "BuT iT wOrKs" and just know that it doesn't change my opinion in the slightest. However, it's a wrinkle the Sixers have to be prepared for. The Nets played zone at the second-highest rate of any team in the league, which adds up to roughly 10 percent of their total possessions on defense. That may not seem like a ton in the grand scheme of things but it is enough to represent a real change of pace for Brooklyn if and when they decide to roll it out. Philadelphia didn't struggle much against the look when Brooklyn turned to it against them in the regular season, but the lineup combinations will matter here. If the Sixers stick with star combinations they went with later in the year (Embiid-Simmons and Butler-Harris), a zone defense might not be a bad idea for Brooklyn against the first pairing. Packing the paint would alleviate some of Brooklyn's concerns defending Embiid one-on-one, and they already know Simmons is not going to bust the zone as a shooter. If Brooklyn goes to this strategy, the good news for Philadelphia is that they've grown accustomed to attacking defenses that tilt coverage away from Simmons. Redick's gravity on handoffs draws major attention, zone or not, and once you create that first pressure release it's just about making the right reads from there. If the outcome is an open-ish Redick three, the Sixers will live in that look all day, and if it's a cutting window for Simmons or one of their bench athletes, that's not a bad deal either. Since Brooklyn probably won't be able to get away with a lot of personnel kookiness, this is a realistic way for them to dictate the way the game is played. We'll see if it works. Despite the outcry over Embiid's availability on Wednesday evening, I went forward with this preview as if the big man will be good to go for Game 1. It's almost not worth preparing for another outcome — the Sixers are an entirely different and borderline unrecognizable team. In the event he isn't good to go, their biggest matchup advantage is suddenly gone. The Sixers have a number of backup plans, no doubt, but it's hard to understate how much they'd miss him on both ends if he can't go. Russell's inability to draw fouls and struggle to generate points near the hoop would be a much smaller concern for Brooklyn with any other option anchoring the defense for Philly. The only silver lining here is that the Nets, unlike a lot of the Eastern playoff teams, don't have a true stretch five who can drag Boban Marjanovic out of the paint. Even their small-ball option, Rondae Hollis-Jefferson, is an abysmal shooter, so you can have Boban hang back as long as your point-of-attack defender is successful fighting over screens. That said, the Sixers have enough talent that they should be able to beat Brooklyn either way. Heavy emphasis on should, of course — we said that about a lot of their regular season opponents, and look how that turned out. Finally, there is no reason for anyone on the Sixers to be saving their legs. The build-up period is over, and we should see the best defensive effort the team has offered in months. I'm especially interested in tracking Butler this series, who has been given some benefit of the doubt for his on-and-off play because everyone expects him to turn it up a notch in the playoffs. We have seen brief flashes of how devastating he can be when he's in the mood, we just haven't often seen him in the mood for an entire game on both ends of the floor. Whether an uptick in defense is enough to offset some of Butler's weird quirks and habits this season, like his sudden aversion to threes, is up for debate. But if Brett Brown is the guy with the most riding on this playoff run, it's Butler who will be right behind him in that department. Someone is likely going to pay him the max no matter what, but a strong postseason performance would give him options and leverage in free agency. It has not been a perfect marriage here, but it's one both sides will make work if they feel its in their best interests. And while Simmons' attentiveness has not dipped in effort as often as Butler has, the same applies to Philadelphia's second-year phenom. This is a series where he should be able to influence the outcome — the Nets' guards can't hold up against him inside, and they're not quite good enough to defensively to phase him out entirely as other Eastern playoff teams can. We got an excellent round one from Simmons last season, and I think we should expect the same this time around. I am not going to overcomplicate this one. The Sixers are the better team, and while Brooklyn may be a tricky matchup for Philadelphia, the talent gap alone should be enough to put this out of reach.